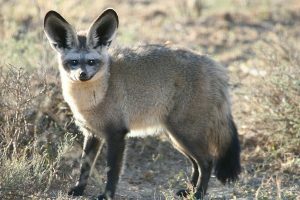 The Bat-eared Fox is a species of very ancient canines that was widely distributed in the middle Pleistocene era, around 800,000 years ago. 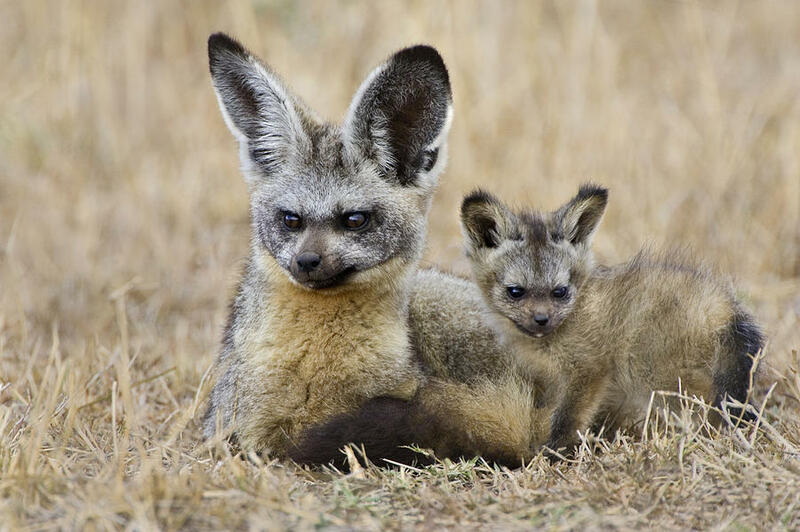 These foxes are found only in the continent of Africa and are known for their large, bizarre, bat-like ears. 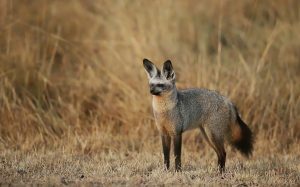 This animal is known in many names, including Delalande’s Fox, Long-eared Fox, Big-eared Fox, Black-eared Fox, Cape Fox, and Motlosi. Size: Average length is 55 centimeters, including the head and the body. Weight: They weigh between 3 and 5.3 kilograms. Fur/hair/coat: The body hair is copper-gray to tawny, while the legs and the tip of their dense, bushy tail are black. Ears: The most distinguishing features are its black, pointed ears that measure about 13 centimeters, each. Eyes: The eyes are dark, almond-shaped. Teeth: Each tooth is very short in length, unlike most other fox or jackal species. In the wild, the bat-eared fox would live for about 13 years, whereas in captivity (as pet), the maximum recorded lifespan was 17 years. These foxes are distributed in two different regions of Africa – the southern and the eastern parts that include Mozambique, Namibia, Tanzania, Zambia, Zimbabwe, Botswana, Kenya, East Africa, Samburu, Kilimanjaro, and South Africa. 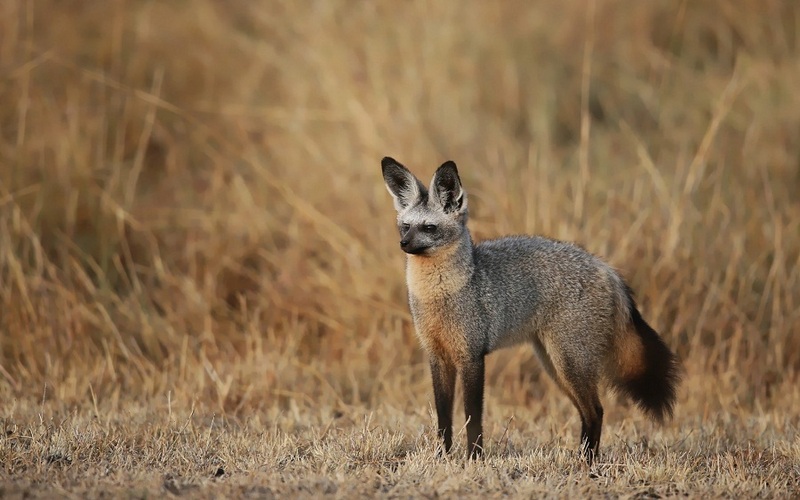 These foxes are mostly found in short-grass plains and the areas where small arthropods including termites and beetles are abundantly available. 2. Otocyon megalotis virgatus found in ethiopia and south Sudan to Tanzania. 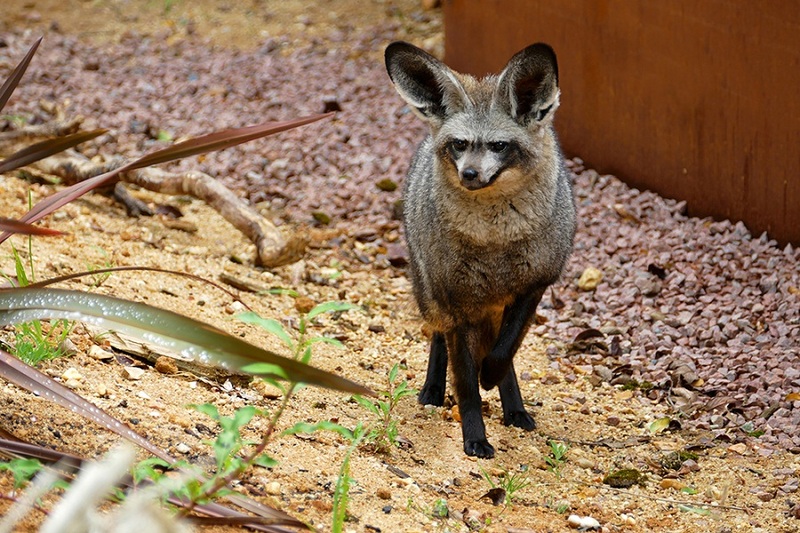 The Bat-eared Fox is mostly nocturnal with 85% of all their activities taking place at nighttime. Being said that, it means that in South Africa these canids are usually diurnal during wintertime and preponderantly nocturnal in summer, and the summer months are more predominant in a country like South Africa in any given year. A study suggested that these fox families are territorial and would occupy home ranges of about 0.25 to a maximum of 1.5 sq km, marking their home range boundaries using urine, quite much like many other foxes, wolves, dogs, and coyotes. However, the population density may reach up to 10 individuals per sq km. A single group or family is made of a pair of an adult mating male and female. The couple usually lives in their own, single burrow, while sleeping, resting, foraging, playing, assisting, protecting, and grooming each other, together. Benefits of living in groups include increased chances of success in foraging, detection of predators, and as also, the opportunity for the baby foxes to imitate the parents and learn what to eat and how to find them. 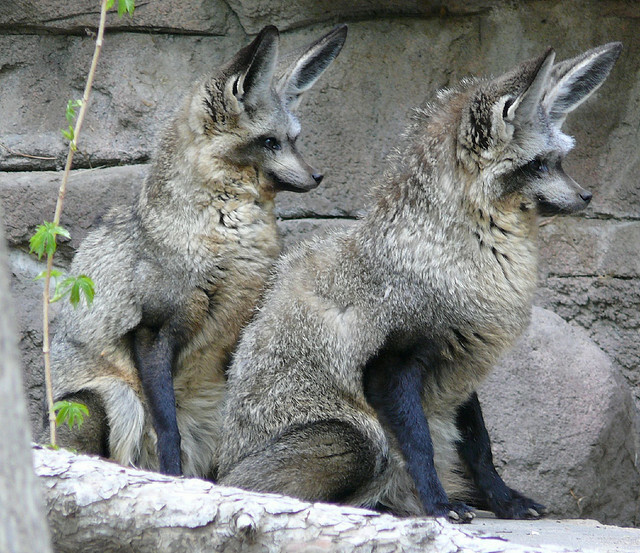 All members in a group, or even outsiders, communicate with each other using ear and tail movements. They would also use a wide variety of soft whistles and sounds. They have nine calls, out of which, seven are low-pitched, meant for use within the family members. These mammals are primarily insectivorous. The majority of the diet of these canids includes small invertebrates like termites, ants, spiders, crickets, and scorpions. 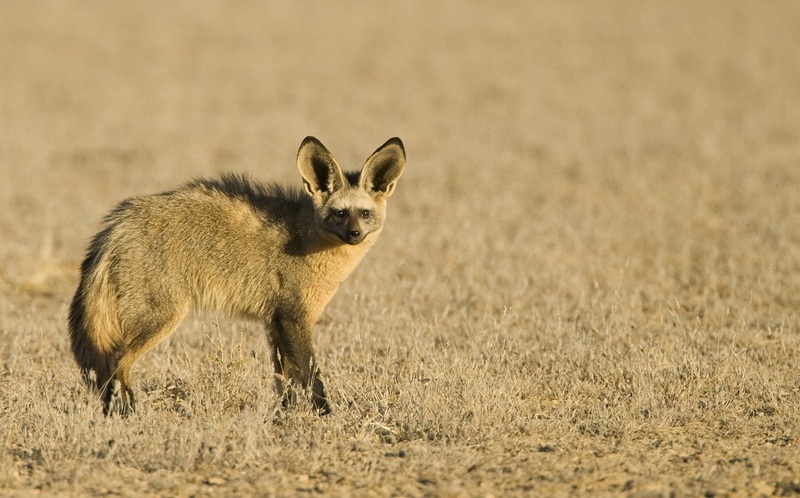 However, the bat-eared foxes will also feast upon other small mammals, birds, reptiles, and even desert truffles. 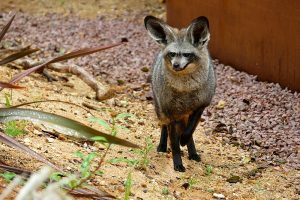 These canines are mostly monogamous with a few exceptions that have been observed with two females living with one male bat-eared fox. The male of the species will stay together with its female partner for the entire breeding season. 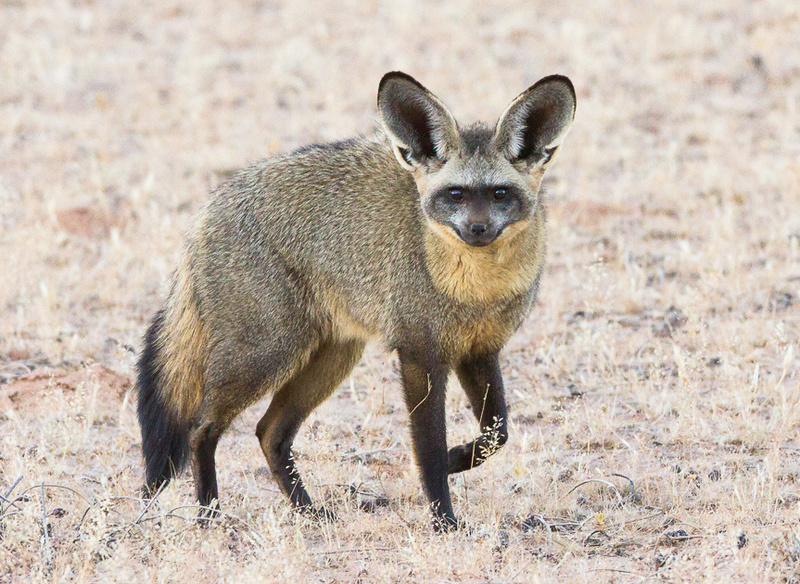 Bat-eared foxes breed once a year with their breeding or mating season falling between September and November. These animals give birth to the offspring in self-dug dens. The female gives birth to 2 to 6 babies at a time (average 4), after a gestation period of 60 to 70 days. The juveniles are born without vision, while their eyes open after around nine days. The young ones come out of their den after about 17 days. When born, the pups are scantily covered with gray fur, while it takes around 4-5 weeks to get the adult color. The father bat-eared fox takes more responsibility than the mother. 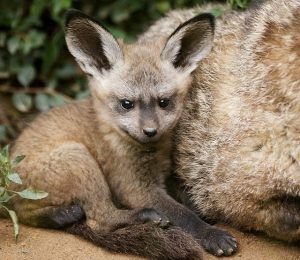 It usually grooms, guards, and plays with the baby foxes even more than the mother bat-eared fox. After the babies are born, the father would stay inside the den to protect its little ones, while the mother would move out in search of food to maintain the production of milk. The baby foxes suckle the mother for about 15 weeks before they leave for foraging for the very first time with their parents. After about 5-6 months, both the male and the female juveniles are fully grown and attain the age of maturity at 8-9 months. When the closest breeding season arrives, most of the siblings disperse from each other, except for some young females that might stay back with the natal group. As their name suggests, these foxes have bat-like ears so as to enhance their sense of audibility. This is for two reasons. The first is, to locate tiny insects like termites and ants that emit very sensitive sounds, while the second reason is that, they live in habitats infested by opportunistic predators, and it is essential for them to sense the vibrations emitted through the movements of an approaching enemy. As a part of their behavioral adaptation, play behavior among the baby bat-eared foxes displays similarities to escape behavior. This is because, when grown up, this species tends to express escape behavior rather than fighting behavior. 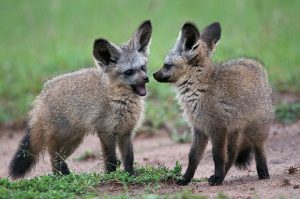 The bat-eared foxes have extra teeth. This dentition pattern is specialized to help them chew insects thoroughly. The lower jawbone is also specially designed to help them open and close their mouth rapidly and munch the insects before they get the chance to escape. 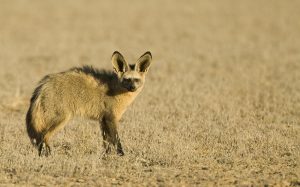 The primary enemies of the bat-eared fox are eagles, jackals, and hyenas. No major threats to the populations of the bat-eared fox exist. The IUCN 3.1 has categorized these foxes as LC (‘Least Concern’) under their Red List. 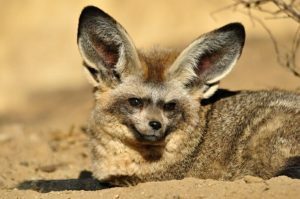 The bat-eared foxes can outrun lions and cheetahs, which means, they can run at a speed faster than 70 miles per hour. 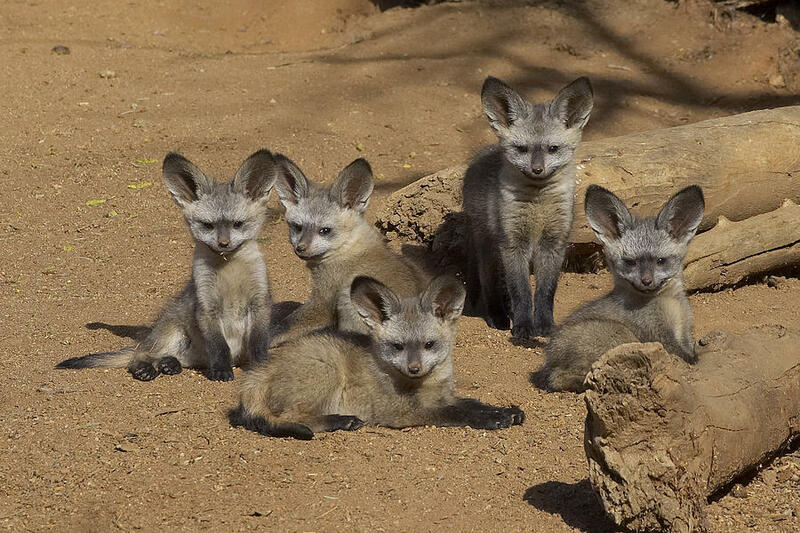 There is one record of communal nursing of a baby bat-eared fox. In a zoo, a pair of these mammals mated ten times a day for an entire week. The species has some commercial use for humans, one of which is its exotic fur. For this, these animals have been hunted by the natives of Botswana. 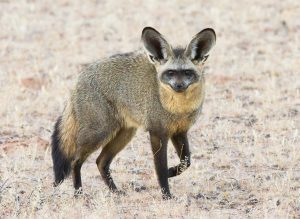 Bat-eared foxes play an important role in the eco-system. They are essential to the harvester to control termite population since these insects are considered pests. 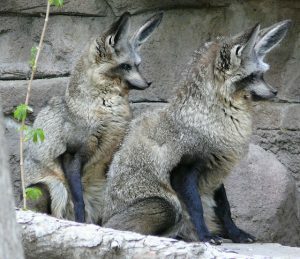 The San Diego Zoo Safari Park’s bat-eared fox family shares a common enclosure with a pair of warthogs since the two mammals are found in the same wild habitat. Because of the smallness of their teeth, they were initially mistaken by some researchers for a canid species that are not closely related to foxes. The generic name Otocyon has been taken from the Greek words otus meaning ‘ear’, and cyon meaning ‘dog’, whereas, the specific name megalotis came from Greek mega for ‘large’, and otus for ‘ear’.